Straaltechniek International is the leading supplier of installations and services in the field of surface treatment. We offer the most advanced solutions in the (high-end) metal processing industry and supply customisation for each specific problem. A global network of sales and service points provides support in the execution of our extremely diverse range of projects. We provide metal processing companies within different sectors with the most innovative solutions. We do that with a strong focus on R&D and from an extremely flexible organisation. Our extremely skilled engineers fully immerse themselves in each specific problem while at the same time setting the highest standards. Where possible, we incorporate insights gained in previously delivered installations in a new concept. Straaltechniek International designs, develops and builds complete installations for shot peening and high-end blasting applications. These are delivered on a turn-key basis and are fully adapted to the client’s individual requirements. Where possible, we limit manual interventions to a minimum, we employ a high degree of robotization. For years we have proven ourselves in this area, to the extent that we are able to include renowned companies such as Rolls-Royce, General Electric and Bos Shelf LLC amongst our clients. You will encounter us all over the world. From the aerospace to the maritime sector and from the offshore to the automotive sector. For decades, Straaltechniek International has been in the top segment of the international market and regularly participates in global projects. Our innovations form a crucial step in the manufacturing processes of our customers. Straaltechniek International aims for a long term relationship with the client. We want to be your partner in business for each specific situation. We understand the possible limitations of processes better than anyone else, enabling us to offer a total solution. A technical installation on its own is not enough, that is why we assist you with exploitation as well. 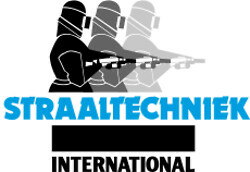 Besides customised solutions, Straaltechniek International delivers a wide range of standard blasting equipment with accessories. You can also contact us for compressed air and paint spraying equipment, and we are also the exclusive supplier for metalizing equipment from the English company Metallisation. With more than 30 years experience, we have accumulated plenty of expertise in the field of dry-ice and wet blasting, shot peening and blasting agents. Straaltechniek International now has 7 branches, distributed throughout Europe. Each branch is characterised by its own particular expertise in surface treatment, which has been obtained thanks to many years of practical experience. We now also work with several, globally established sales offices and joint ventures.